Can the government provide healthcare more efficiently than the private market? There’s no simple answer to that, but a couple of recent data points suggest the answer is yes. When you look at the rate of growth for all the major payers — Medicaid, Medicare, employer-sponsored insurance, National Health Expenditures — what you see is that no other payer has constrained the rate of growth in spending as well as Medicaid has. The reason is that no payer has been as motivated to undertake cost containment as state governments. This is a key insight, and it doesn’t apply only to state governments. One of the problems with the employer-centered healthcare model that we adopted accidentally during and after World War II is that it does a pretty good job of hiding costs. Sure, our premiums and copays rise every year, but most of us have very little idea how much our medical insurance really costs. We pay a small portion, and the rest is, from our point of view, effectively free. By contrast, in European countries, which have done a much better job of controlling costs than the U.S., spending comes largely out of tax dollars, which means that legislatures and taxpayers have to face up to the cost of healthcare every year when they pass a budget. The fact that the process is played out in the rough and tumble of the political spotlight gives everyone a strong incentive to hold down spending. After all, rising costs mean rising taxes. Until the cost of medical care bites, Americans won’t put a lot of pressure on the healthcare industry to rein in its prices and administer care more efficiently. Taxpayer-supported national healthcare could help us get there. 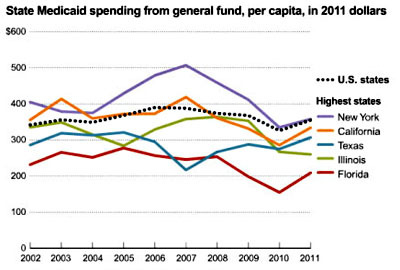 The relative efficiency of Medicare and Medicaid are bellwethers we should pay attention to.